I have recently had to undertake a duty that is one of the more difficult to face up to. My sister-in-law’s uncle, a nice man who always took time to speak with me at family gatherings, passed away last night. Even though I didn’t know him that well, I liked him and his wife, who is twin sister to my sister-in-law’s mother. Many customs of more “civilized times” have fallen by the wayside in the rush of modern life. There are a few which we should fight to keep up. The letter of condolence is one. This is one of those times when store-bought cards, e-mails, voice mails or anything other than a hand-written or at the very least, typed and signed letter is the only appropriate means of communicating your sympathy. 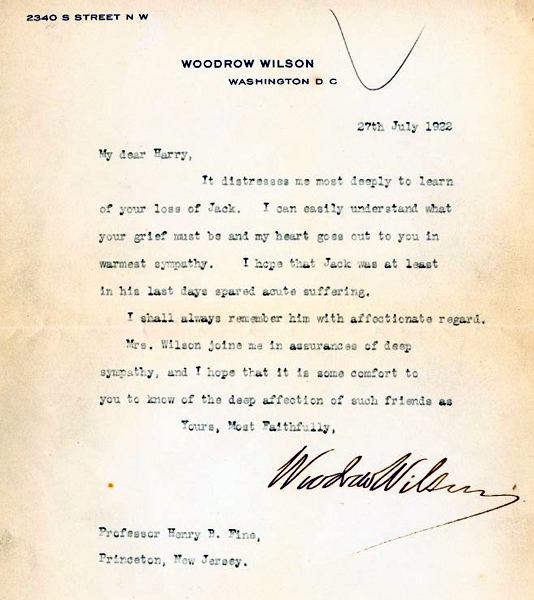 Your letter need not be over-long; the example above is from 1922 and signed by President Woodrow Wilson (for the full story, please visit The online Princeton Library. Write as soon as you hear about it. Offer your regrets on learning of the death. If you have a nice memory of the deceased, now is the time to put it in writing. If you want to attend the funeral, ask nicely and please offer some sort of support for the widow, widower, parent or grown child if you have any feelings for them at all. Like funerals, letters of condolence are for those living with sudden grief. They remind us that none of us is alone.